Well, the title got your attention, didn’t it? One of the things I do quite regularly is take myself off on long walks. I’m lucky that I live near the countryside and so it’s always pleasant to go off on a wander. 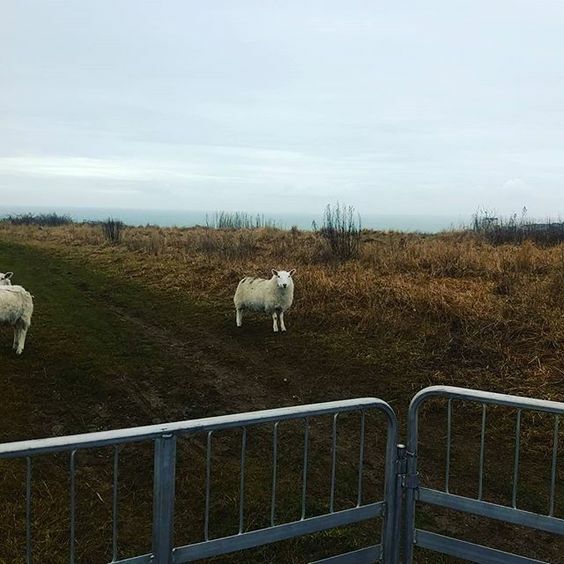 A few months ago, I saw that the council was looking for volunteer shepherds- ‘lookerers’- who could help out by checking the sheep they put in certain areas of the city, checking the fences and so on. I figured that, as I go up there regularly anyway, I could probably help out a bit. After all, I’m a knitter. I like sheep. I applied. And on Sunday, I attended a course. 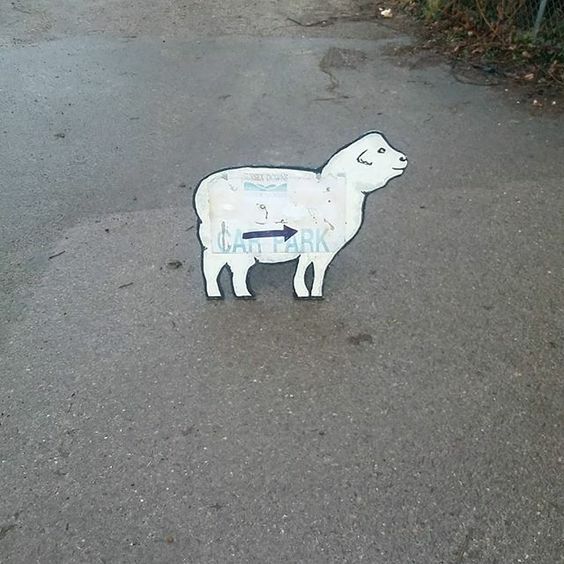 First of all, I had to follow a trail of little wooden sheep to get to the council rangers’ office. I felt like I was in a slightly surreal version of Hansel and Gretel. Once I got there, we went over the day- we were to spend the morning out in a local area called Sheepcote Valley, where the council is currently grazing sheep: a mixture of Cheviot, mules and, my absolute favourite, Herdwick sheep- which literally do not have time for any of your nonsense, thank you very much. They’re quite sassy and don’t really have the herd mentality of the other types of sheep. Sam, the farmer, invited us to have a go at flipping sheep. He makes it look easy. It is not easy. First of all, even in a pen, it’s bloody hard to catch a sheep. They jump and then huddle together in a huge, fleecy puddle of ovine nervousness. Then, you’ve got to get their head just so on one side. If you manage that, they then relax. You can then tip them onto their bottoms, legs in the air, looking like some little Buddha statue; a picture of content. As long as their feet aren’t on the floor, they’re cool. Could I manage to achieve sheep nirvana? No. I have no upper body strength. I have decided that, if on my rounds, I find a sheep that needs looking at, I will call somebody. I have also come to the conclusion that, if there was a life or death situation involving me and a sheep, we’d probably wing it instinctively. Also: this sheep below watched the whole thing as my fellow lookerers-to-be made earnest prats of ourselves. I quite liked her. I thought she looked a bit like a rabbit- she had an amused face and seemed to be quite glad that she was on the other side of the fence. I also saw a skylark and a buzzard whilst out on the Downs. I had no idea what they were until the ranger, Lindsay, told me. I am such a city girl. I mean, I had nail polish on, for God’s sake. In the afternoon, we learnt about why Brighton and Hove use grazing animals to look after the chalk grassland surrounding the city (it’s an incredibly rare habitat for lots of flora and fauna.) We also learnt the basics of sheep anatomy and how the lookerer system works. I’m looking forward to getting stuck in in the spring. I’ve even signed up to work out at the new site at 19 Acres that will have New Forest ponies. I am scared of horses. I am going to have to have pony training. This will be fine. Fine. On a more personally interesting note, I learnt that fleece from a sheared sheep sells (often) for less than £1.50. This seems confusing- after all, yarn is expensive and, even after you consider processing, marketing and so on- it still doesn’t seem to tally. It seemed daft that, at a time when farmers are struggling, that it doesn’t seem to pay to keep sheep for their wool any more. I left determined to learn more about the wool process and how it can help local farmers- could I buy yarn from certain farms? It’s on my to-do list and I’d like to knit a jumper in yarn from a single source (a bit like fancy coffee or chocolate, I suppose.) I also left thinking about how I could use my garden more sympathetically to that unusual soil makeup and support the butterflies and insects that are being eradicated from Sussex. But could I flip I sheep? Could I billy-o.